About three years ago, Austin Krause had an idea. At the time, the idea represented more of a farfetched dream, one of those subconscious wisps of an optimistic goal that most of us would lose with time, a busy schedule and pre-existing obligations to life. But Austin doesn’t often neglect his dreams. I’m driving down a long, straight dirt road near Big Piney, Wyoming, (population 562). It’s the middle of July and the air is hellishly thick and hot. The constant high-pitched drone of mosquitoes and crickets is part of the Big Piney orchestra during summer months. The only other sound comes from tall grass, gracefully dancing in the gentle wind and echoing around the emerald rolling hills. A small dot followed by a huge cloud of dust appears in the distance down the road ahead of me. As the dot gets closer, I’m able to make out a man wearing canvas overalls and a cowboy hat, recklessly piloting an ATV towards me. I slow to a stop, apprehensive, in fear that I’ve taken a wrong turn and am about to be confronted by this cowboy on the four-wheeler. Skidding to a halt, the long-haired man cracks a toothy grin. I recognize Austin as he fluently steps off the quad, followed by a wily looking Australian shepard who jubilantly hops off of a platform made for him to ride on the back. Austin and I exchange hugs, stories from the summer. Then there’s a glimmer in his eye as he definitively states, “It’s finished,” referring to the project I’ve traveled 1,500 miles to see. About 30 minutes later, we pull up to the pine-paneled ranch house and red barn where Austin grew up. I’ve know him for almost 10 years, but realize that I’ve never heard anything about this utopia of sorts. It explains a lot about my soft spoken, engineer friend who carries a charismatic and charming presence beyond his years. Walking up to the barn, Austin looks back at me to make sure I’m looking as he prepares to open the giant doors. It’s as if we’re about to unearth the holy grail in the middle of Wyoming. The door opens. 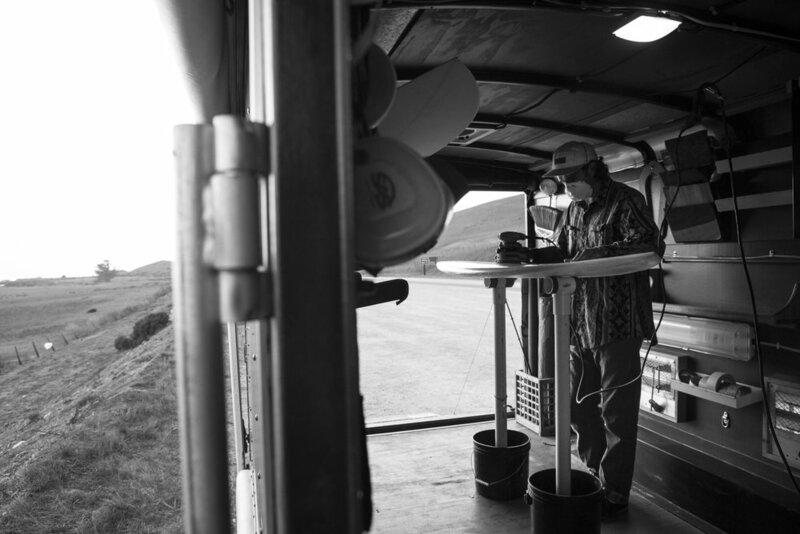 I’m excited to discover that the far-fetched dream which I had heard about months ago and written off in my own mind, had turned into a very real, 16-foot-long trailer, transformed into a mobile surfboard shaping bay. Immaculately put together and laid out, this facilitator-of-surf on wheels strikes me as something a surgeon or a pilot would appreciate. Every tool has a specific place, which must suit each tool’s specific purpose. 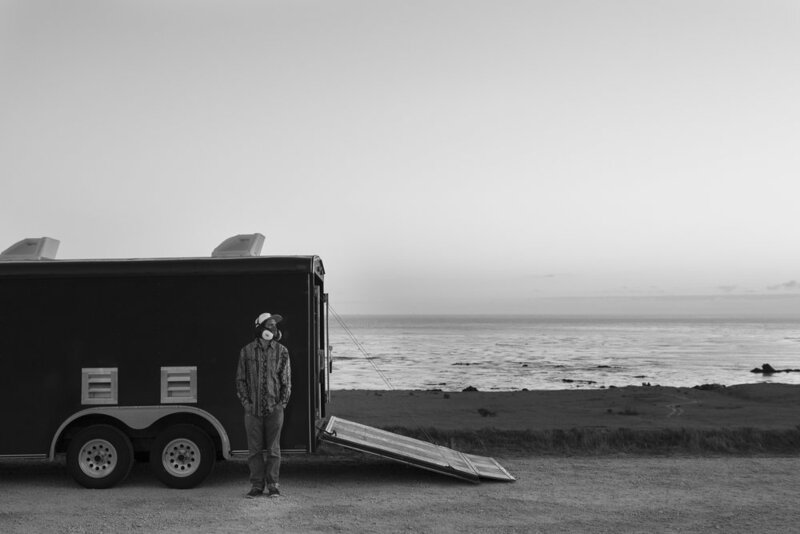 Austin and his father, who both studied mechanical engineering, purchased the trailer early in the summer of 2104. It was initially designed to tow ATV’s. According to Austin, they worked on the trailer nearly every day, slowly watching the dream that he had shared with his father months ago turn into a reality. Austin admits that before purchasing the trailer, he had only built one surfboard. And that was part of a class at Cal Poly San Luis Obispo that taught students how to shape boards. He ordered five pieces of foam from Fiberglass Hawaii, and in between working on his family’s ranch and constructing the trailer, began chipping away at what would eventually become his main source of income – shaping surfboards. “It’s a beautiful struggle,” he noted. By about his third board, though, he was starting to get the hang of the process. He even started stylizing his boards to resemble the first old- school performance shortboards from the late 70’s. By the end of the summer, the trailer was complete and ready to be pulled to its new home on the central coast in California. The trailer truly defines taking life “on the road.” There wasn’t any point in time that lead Austin to leave an old life behind to start a new one. In fact, Austin has incorporated as much of his “old life” as he could squeeze into the 16 foot long trailer.